Pristine, majestic, and breathtaking. These are the adjectives used to describe Pasig River. But that was before people started dumping their wastes into the river. Today, the water is so dirty that one bucket from it would have been enough to wipe out the dinosaurs. So whatever happened to the once-alluring river that had inspired many an artist? Well, industrialization happened. And so were the drastic changes that came with it. Before we knew it, the entire river ecosystem went downhill in a manner that would have made our ancestors cry in disbelief. But there’s still hope. There is, in fact, a foundation committed to bringing Pasig River back to life. And if that’s not convincing enough, perhaps these little-known facts about the river’s colorful past will make you want to clean it up. Pronto. 9. The original Pasig River lighthouse. 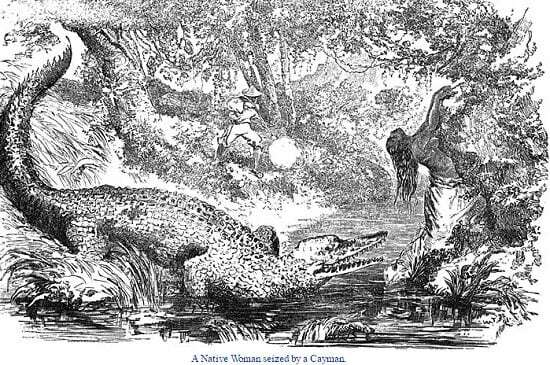 Original caption: “A native woman seized by a cayman.” Source: “Twenty Years in the Philippines (1819-1839) by Paul de la Gironiere. True enough, history shows that crocodiles once wreaked havoc on the Pasig River. In his book Relacion de las Islas Filipinas, the Jesuit Fr. 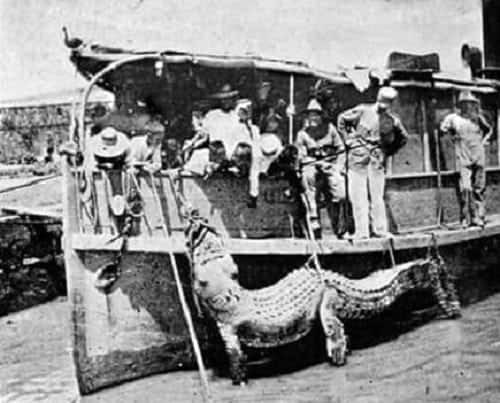 Pedro Chirino recounted how a 17th-century Filipino chief grappled with a 36-foot crocodile from the Pasig River. There was a time when ducks found the waters of Pasig River clean enough to drink and bathe in it. In fact, a community of duck raisers is said to have blossomed from the banks of the river. 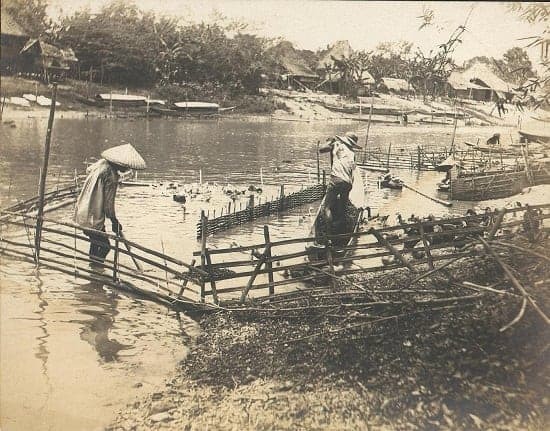 The business thrived for many decades, specifically in the areas of Pinagbuhatan and Kalawaan where many families relied on ducks for their bread and butter. Sadly, it was the duck industry that took the biggest hit when the Pasig River deteriorated. 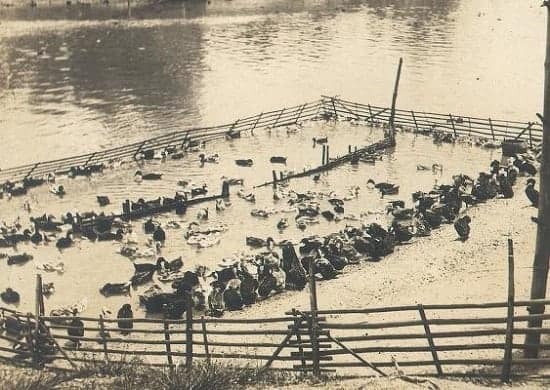 Starting in the mid-1960s, river snails (“sambuele”) which were eaten by ducks became scarce–so was the unpolluted water necessary for these ducks to thrive. 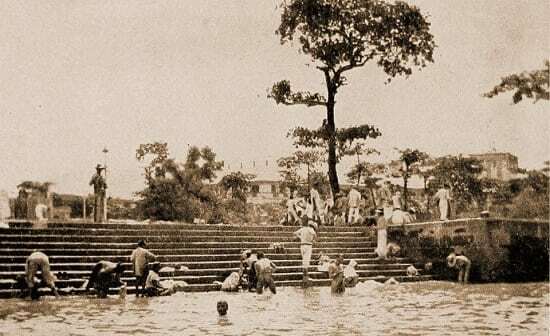 Pasig River bathing place at Quiapo, Manila, circa 1900. Source: Pearl of the Orient: Discover Old Philippines. Our very own Pasig River used to be like this–a place where people could clean themselves and escape Manila’s sweltering heat. Today, you can still see humans swimming in the biologically-dead river, but they’re either floating corpses or kids who have no idea what they’re getting into. 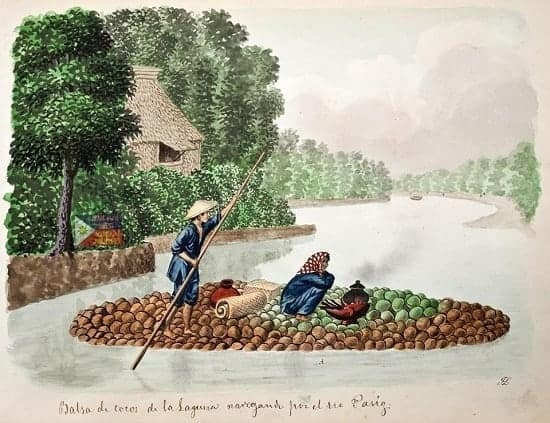 Source: “Twenty Years in the Philippines (1819-1839) by Paul de la Gironiere. 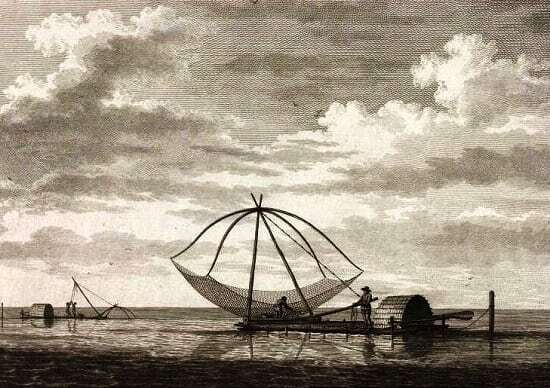 Odd as it may look, the giant net obviously made a lot of fishermen happy because it helped them catch more fish. 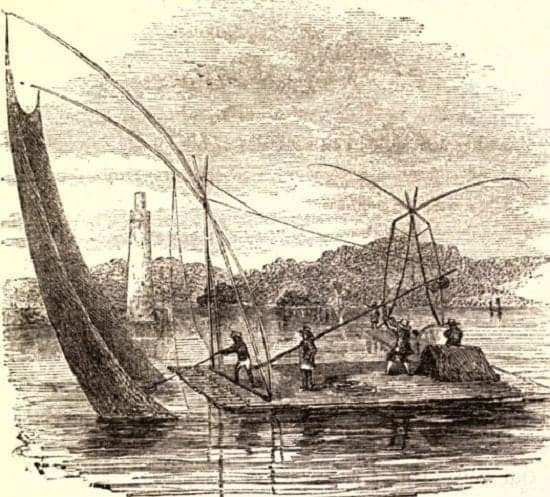 In addition to that, the fishing contraption was set up in a way that made it easier to transfer it from place to place without the need to repeatedly spreading the net. All they needed to do was dip it into the river water and haul it up once it’s full of fish. 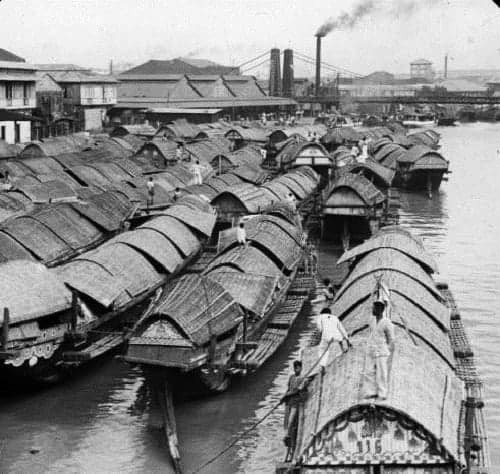 House Boats on the Pasig River, Manila, P. I. Copyright by the Keystone View Company. The original slides are housed in McConnell Library’s Special Collections. 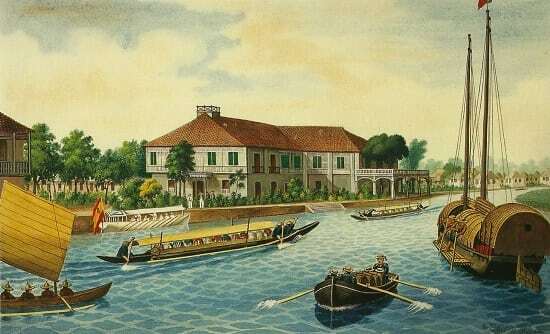 “Balsas de cocos de la Laguna navegando por el rio Pasig.” 1857 Painting by Jose Honorato Lozano. Coconuts, however, were a lot heavier and came in larger quantities. A single casco was obviously not built to handle such cargo. Either they would deliver the coconuts via carabao carts or follow what others were already doing–make coconut rafts. However, not all the time that these coconut rafts were reliable. In the end, it would all still depend on the weather. In 1906, for example, a strong typhoon in Laguna blew over the coconut rafts, scattering as much as 200,000 coconuts in the process. 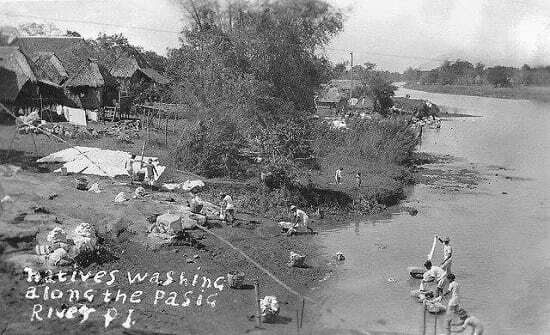 Natives washing clothes along the Pasig River, early 20th Century, Manila, Philippine Islands. Source: Memories of Old Manila Facebook Group. 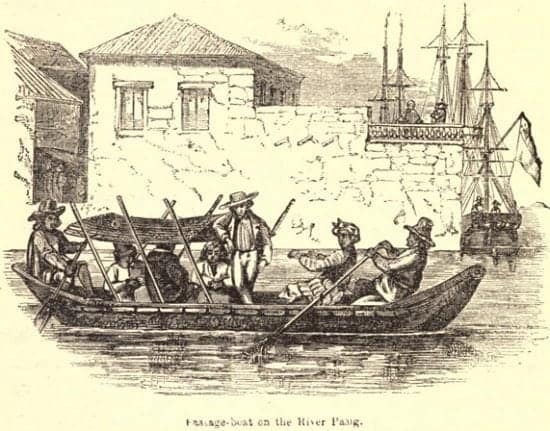 Pasig River not only provided people with a means to bathe themselves but also a place where they could wash their clothes. 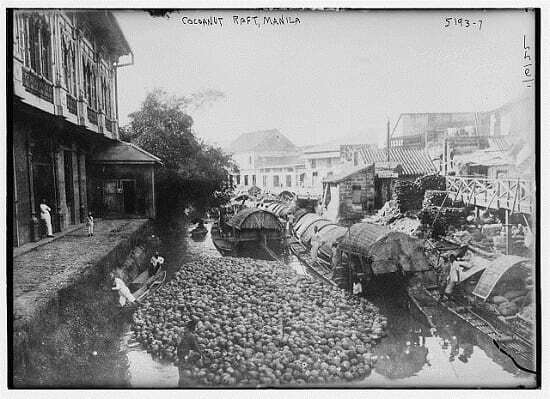 A hundred years later, the Pasig River could no longer keep up with the drastic changes taking place in Manila. By 1960, people stopped washing their clothes, which soon followed by the decline of ferry services. From Fr. 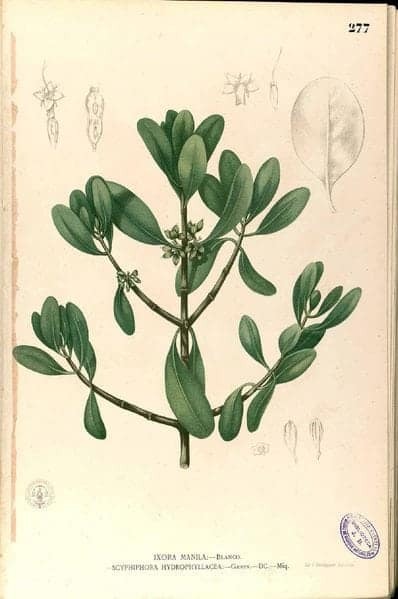 Manuel Blanco’s 19th-century book, “Flora de Filipinas.” Via Wikimedia Commons. You’re looking at the picture of the plant from which Manila is said to have derived its name. Nila is actually the Sanskrit word for indigo. Eventually, nila became the name of the flowering mangrove that used to grow abundantly along the shores of Manila Bay and the banks of Pasig River. The nila shrub (Scyphiphora hydrophyllacea), which can grow up to 4 meters high, eventually died off as the toxic wastes slowly killed Pasig River. 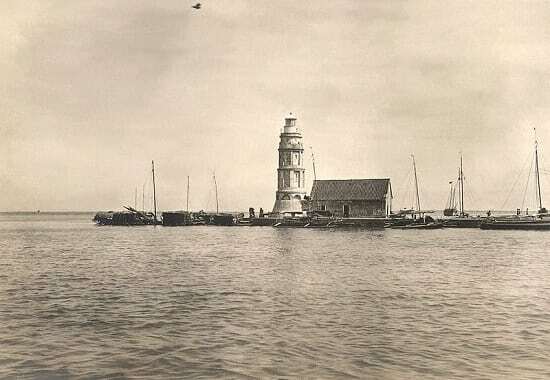 Pasig River Light, the first lighthouse in the Philippines, 1902. University of Michigan. Special Collections Library. Via Wikimedia Commons. Built in 1846, the Pasig River Light had been an important and iconic landmark for almost 150 years. Measuring 49 feet tall, the original farola had both the Renaissance revival and Victorian architecture styles. Sadly, in 1992, the authorities finally got rid of the structure and replaced it with another lighthouse that is architecturally inferior. José Honorato Lozano, Quinta de los Generales en Malacañan a la rivera del Río Pasig, 1867. Source: Presidential Museum and Library. Some say that the status of the river is a reflection of the civilization that formed around it. I guess that only means we’re growing backward. Or are we? Alejandro, R., & Yuson, A. (2000). Pasig: River of Life. Unilever Philippines. Census of the Philippine Islands: Taken Under the Direction of the Philippine Commission in the Year 1903, in Four Volumes. (1905) (p. 131). Coconuts in Laguna and Tayabas Province. (1908). de la Gironiere, P. (1854). Twenty Years in the Philippines (1819-1839). New York: Harper & Brothers. Ocampo, A. (2010). Looking Back. 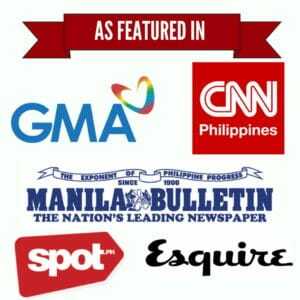 Mandaluyong City: Anvil Publishing, Inc.
Ocampo, A. (2014). Looking Back 8: Virgin of Balintawak (pp. 31-33). Mandaluyong City: Anvil Publishing, Inc.
Technology Review, Volume 34. (1932). ← QUIZ: Can You Guess These Famous Manila Landmarks By Their Old Photos?